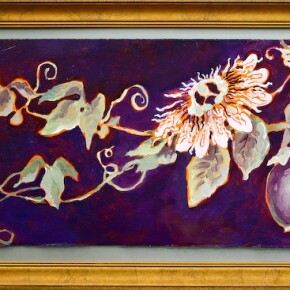 Height: 21″ Width: 39″ The passion vine, with its delicious fruits, dancing tendrils, and exotic flowers growing on my fence, was the inspiration for these paintings. 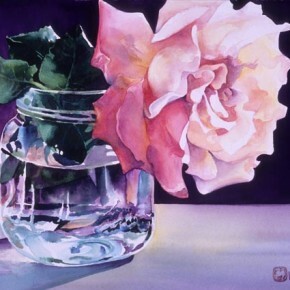 This rose was so big and beautiful I had to paint it. 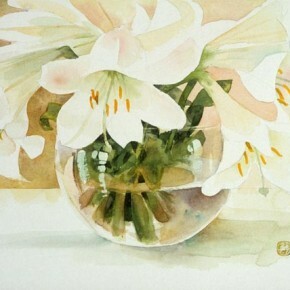 It was brought to me as a gift by my friend, and fellow artist, Lee Ruggles of Sausalito, CA. 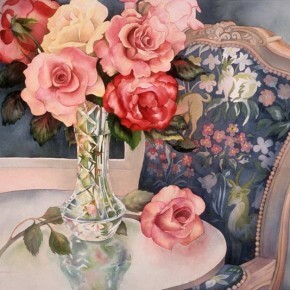 Height: 11″ Width: 14″ For this painting, I photographed the flowers from a client’s garden, her vase, and her chair.